On April 12, 2014, Kiev hosted a conference The Left and the Maidan, which brought together activists from anarchist, socialist and communist organisations that had been involved in the Maidan movement in late 2013–early 2014. The initiative to hold the conference came from the Left Opposition organisation («Ліва опозиція»), the Centre for Societal Studies (Центр дослідження суспільства), the Centre for Social and Labour Research (Центр соціальних і трудових досліджень), and the social critique magazine Спільне (The Commons), and was supported by the Rosa Luxemburg Foundation. The conference provided an opportunity for left-wing political activists to take stock of their participation in the mass movement, analyze the mistakes they had made, and discuss possible further actions. The large number of participating activists who represent the various political groups and initiatives evolving as a part of the Maidan movement is clear evidence against the alleged absence of the Left in the Maidan movement. The discussion was centered on why the Left had failed to take an organisational form and become as visible a factor of the Maidan as the right. Left to right: Zakhar Popovich (standing), The Left Opposition; Alexey Arunyan, Crimean Maidan; Nina Potarskaya, Women’s Squadron (Hundred); Irina Kogut, Hospital Watch; Nina Khodorivska, Students’ Assembly; Bogdan Biletskyi, Direct Action; Alexey Simvolokov, Machine-builders’ Union, Dnepropetrovsk; Yurii Samoilov, Coal Miners’ Squadron (Hundred), Krivoi Rog; Vladimir Chemeris, Public Council of the Maidan. The Maidan movement was changing rapidly and dramatically with every day. Started as a protest against the government’s refusal to sign the EU Association Agreement, it was transformed into a movement against the deceitful and corrupt nature of those in power, against police violence and attempts to impose anti-democratic laws. At the initial stage, Left activists did not attach a lot of importance to the protests, seeing the European integration slogans as alien to them, and limited their involvement to infrequent small-scale actions that would put forward social demands and criticize the EU’s antisocial policies. Yet, the moment the authorities resorted to violence and blood was spilled, the situation changed radically. Things were taking a serious turn; the Square was no longer a gathering place for European integration supporters, becoming a gathering place for those who opposed tyranny. At that moment the Left’s attitude to the protests changed. Nobody was prepared for such a turn of events, of course, least of all the Left. “Before, we’d been doing some circle work to educate and enlighten people, but we had no experience taking part in a mass movement and protest actions” (Nina Potarskaya of the Women’s Squadron [Hundred]). The public context was changing with breathtaking speed. 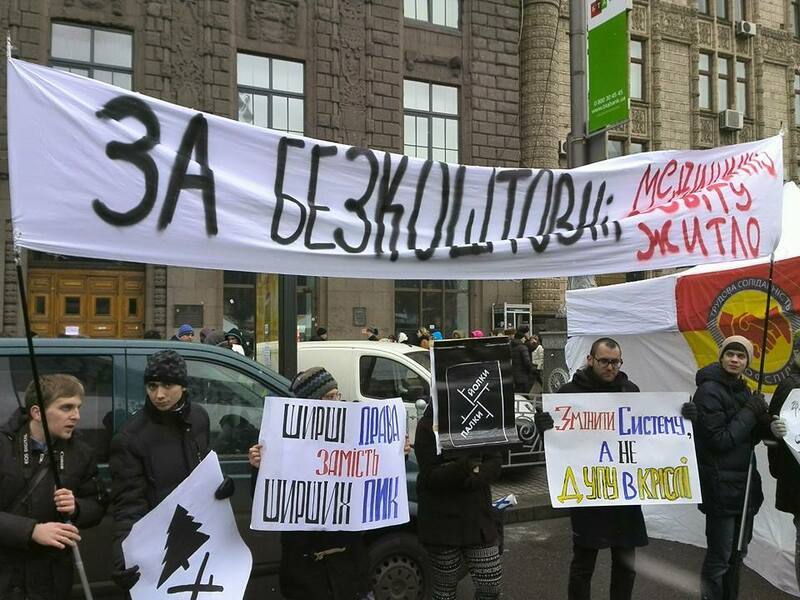 A general anti-fascist action in Kiev was scheduled for Jan. 19, to commemorate Stanislav Markelov and Anastasia Baburova, who were killed in Moscow in 2009. On that day the police began brutally beating up protestors, which brought more and more people out into the streets. It would have been unnatural for the Left to stay away from a movement against police violence. “Combat actions began, and we had to change the format of our activities; indeed, it would be unthinkable to just hop around the Square taking pictures with your camera when wounded people fell all around you, people who needed help” (Nina Potarskaya). The Maidan was a broad democratic movement directed against the corrupt Yanukovych regime, and in terms of its political colouring it, of course, was not left, just as it was not right either. If we are to trust the polls, 93% of the Maidan participants were apolitical. Only 7% had belonged to a political group. Among those 7%, socialists had their niche. In this broad mass movement, each of its political wings had a chance to manifest itself and act in line with their own tactics. But, having joined the Maidan later than others, the Ukrainian Left were in a predictably weaker position than their opponents from the right. At the same time–unlike, for instance, the Russian Left who have constantly been in an open street conflict with right extremists and set up self-defense structures–Ukrainian socialists were unprepared to oppose blatant aggression and the organised violence of the right. This forced the Left Maidan to fold their black and red banners, turn a blind eye to the presence of right-wing ultras, and adopt the tactics of involvement in the general democratic processes through active agitation within the broad civil movement. “The important thing was to get our message across rather than identify oneself [as the Left]” (Irina Kogut of Hospital Watch). “Proclaiming oneself openly as ‘left-wing’ would only serve to provoke violence from the organised right-wing groups, making it impossible to do one’s work” (Nina Potarskaya). “We made an attempt to announce the formation of the Anarchist Squadron, but 70 uniformed nationalists turned up at the meeting and we had to fold and start working within the Students’ Assembly” (Bogdan Biletskyi of Direct Action). Yet the Assembly was fully controlled by the anarchist students’ union Direct Action, and all of the Assembly’s slogans were social ones. Socialist agitation was under way at the Assembly, and there were lectures and socially relevant films. Maidan was not left-wing in terms of its composition but it was left-wing libertarian in spirit. It was driven by protest against corruption and tyranny, humiliation and depression, by masses of people who felt their dignity had been offended by their rulers’ lies and who suddenly became aware of themselves as a single nation. It was the emerging protest against their personal enslavement and the aspiration to be free that were bringing more and more people into the Square. And it was not only the anti-authoritarian motivation and nature of the Maidan that spoke of its left-wing essence, but also its modus operandi. The Maidan used methods that we traditionally consider our own: direct participation, self-organisation, direct actions, rejection of leaders, and a resounding NO to the steering and pace-setting role of parties. “The Maidan led to the toppling of tyranny and triggered development of direct participation and self-governance, which, in essence, is the socialist way” (Alexey Simvolokov of the Machine-builders’ Union, Dnepropetrovsk). “Self-organisation sent mediators, both State and political ones, packing. They were rejected. Giving mediators the sack was pushing the masses to the Left, towards society’s greater control over political institutions and the State” (Nadezhda Shevchenko). At the same time, the totalitarian Left who were used to leading and steering did not benefit from the mediators’ sacking; the majority of them were critical of the movement. 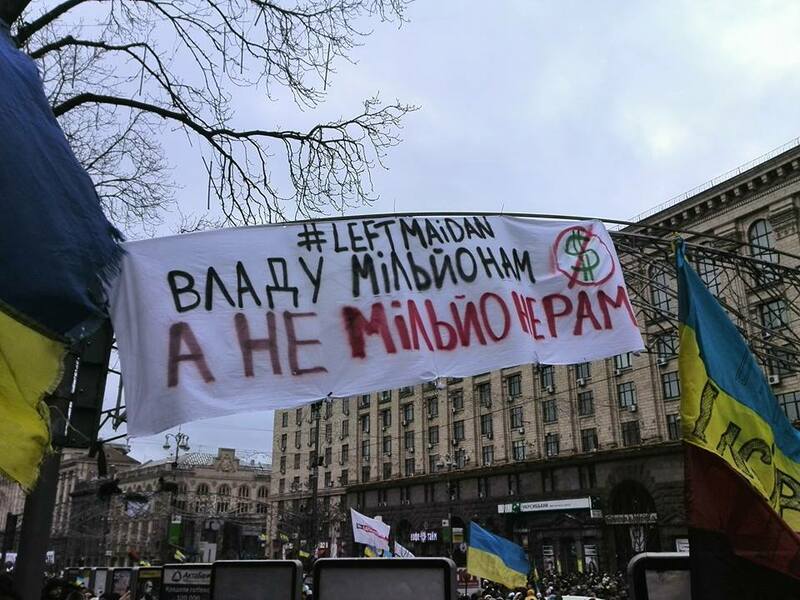 The Communist parties used their mass publications to discredit the Maidan, building upon the idea that the power had been seized by a fascist junta, while some rushed off to create and support “Anti-Maidans” in the southeast of the country. One conference participant titled his presentation The Maidan as a Triumph against Communism, interpreting “communism” in Stalinist terms. This resulted in a big discussion. One can argue about nuances, but the really evident thing was that walking onto the Maidan carrying a portrait of Stalin was not only senseless but also unsafe. The same applied to carrying a portrait of Hitler. The Maidan, by its very nature, had no room for symbols of tyrannies and despotic dictatorships. Those who joined the Maidan protests represented anti-authoritarian, democratic Left groups that could not remain uninvolved. 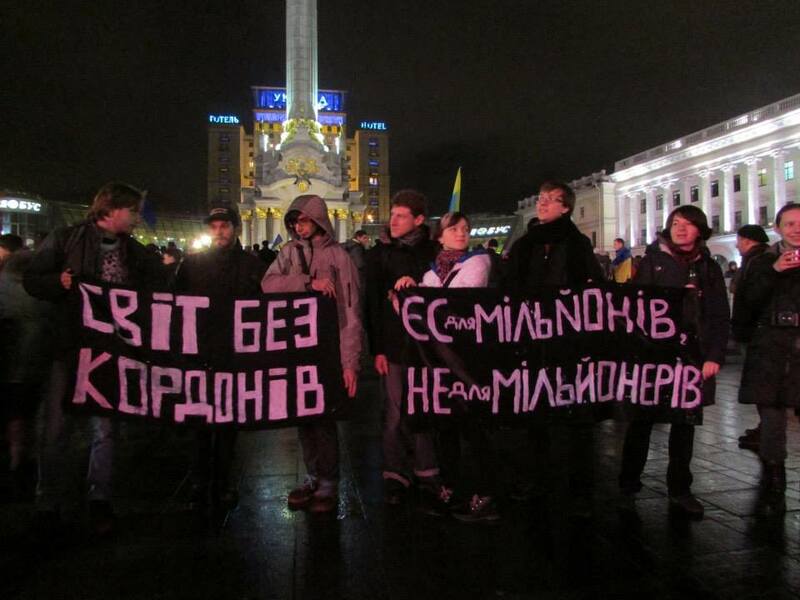 “We had to be there; indeed, this protest as such has social roots, it is the result of social problems” (Vladimir Chemeris of the Public Council of the Maidan). “From the very beginning the Maidan had the support of the free trade unions affiliated with the KVPU (Confederation of Free Trade Unions of Ukraine). Trade unions are the foundation, the first stage of the working class self-organisation, and we, machine-builders of Dnepropetrovsk, perceived the Maidan as, first and foremost, a social protest, but later it was the whole country taking on tyranny. The workers who came with us quickly became politicized” (Alexey Simvolokov). There were quite a lot of the Left in the Maidan and they had opportunities to develop their own initiatives and agitation. Left Opposition activists were agitating under a red banner and later prepared a 10-point list of social changes based on Lenin’s April Thesesand provisions of Trotsky’s Transitional Programme. “The document was distributed in Ukrainian in the Ukrainian House [international convention center] and was approved as a programme in line with the interests of the Ukrainian people” (Zakhar Popovich of The Left Opposition). “The Women’s Squadron (Жiноча сотня) criticised sexism in the Maidan and agitated against right-wing ideology” (Nina Potarskaya). “The Students’ Assembly opened in the Ukrainian House on Jan. 28 and its contents were absolutely left-wing. The Assembly coordinated students’ and youth initiatives, drafted the programme for a Free University, organised protests, recruited volunteers to medical aid teams, and worked on visual arrangements in the Maidan” (Nina Khodorivska of the Students’ Assembly). One of the most important projects implemented by the Maidan Left was Hospital Watch («Вахта лiкарень»). “It was an anti-police project rather than just a humanitarian one” (Irina Kogut). In the hospitals there was a need to protect the wounded and those who had suffered from police violence. Yanukovych’s police were seeking such people in the hospitals and their protection became a political issue; the idea was to give people some experience of resistance to police brutality and to the State. The initiative involved around 25 activists, all of them leftists who carried out anti-governmental agitation in dozens of Kiev hospitals. Every day the Hospital Watch was joined by over a hundred volunteers who were constantly replacing each other. The main task for the Left in the Maidan was not to identify themselves as such but rather to introduce socialist meanings and ideas into the movement. Now we find ourselves bombarded with criticisms and accusations that the Maidan Left have contributed to the right-wing provisional government’s ascent to power. This is wrong. The Maidan as a phenomenal, broad, mass movement should not be associated with the new Ukrainian government, professional politicians, or individual parties which were a part thereof. Besides, there are no non-oligarchic leaders in Ukrainian politics and, whatever the outcome of the Maidan, there would not be any room for the Left in any government. Any Ukrainian government would be a right-wing one. The Left did not work in the Maidan for the sake of oligarchs. They did all they could to involve as many people as possible in various anti-authoritarian forms of public organisation, promoting a critical attitude to the ideas of fascism, homophobia, and sexism, as well as to liberal economic programmes. “About half of the Maidan Left were anarchists who never seek taking power or being involved in authority. We simply work towards the development of non-governmental institutions as an alternative to the State” (Nina Khodorivska, Irina Kogut). Results of this work will surely manifest themselves in the nearest future when life has returned to its peaceful course and an enormous mass of workers will feel on their necks the strangling noose of the “economic aid” programmes offered by the international financial institutions. Historical Responsibility of the Left: Where Have We Failed? It is evident that the Maidan became a real challenge to the Ukrainian Left. Never in the past has the country experienced such an upsurge of people’s activism resulting from the need to defend their freedoms in the face of the government’s armed aggression. The situation was changing by the minute. There was no time to discuss strategies and tactics. Everyone just did what he or she believed was required. Today, during a respite of sorts, one can critically look back, make an initial analysis of what did not work in order to better prepare for new mass manifestations. The weakness of the Maidan was the insufficient involvement of trade unions and the working class. Only 5-7% of all Maidan participants could be categorized as workers, which, come to think of it, is natural: participation in a public protest is extremely complicated for workers. “Workers work, they cannot afford to stop working and risk losing even that meager income for their families” (Yurii Samoilov of the Coal Miners’ Squadron [Hundred]). So, it is quite logical that the bulk of the protesters were students, pensioners, office clerks, civil servants, small entrepreneurs, etc. Furthermore, none of the Kiev Left agitated in workplaces or bridged the protests and the workers’ community. The free trade unions’ call for a general political strike just hung in midair. Next, all the participants pointed out that despite a large number of the Left involved in the Maidan, there was practically no coordination among them. Having joined the protests later than the right-wingers, the Left rushed into the thick of it and did not have time to create their own organisational structures, unlike the right wing. “The lack of coordination among the Left initiatives—the groups of Marxists, social-democrats, and anarchists—was a big problem” (Bogdan Biletskyi). The third area where the Left have failed to find their bearings has to do with soaring separatist actions in southeastern Ukraine. Since protest movements in all regions were based on popular dissatisfaction with the corrupt regime of Yanukovych and the deterioration of people’s social situation, and since Yanukovych was equally hated in the Crimea and in the Volhynia, the Left were in a position to formulate a programme of a people-friendly social order that could enjoy equal demand and support throughout Ukraine. Whatever turn the situation takes next, it is imperative for the Left to consolidate in order to create a left-wing political project so they can oppose the right-wingers now in power and the growth of Ukrainian chauvinism in an organised manner. “We must clearly formulate our position vis-à-vis right-wingers and completely dissociate ourselves from them” (Nadezhda Shevchenko). That is needed to preserve and defend the democratic values of the Maidan, the freedoms that are already being suppressed by the new authorities. “The Maidan quiets down, yet the anti-oligarchic idea has not taken root and people are force-fed entirely different meanings of the events” (Igor Panyuta). “In fact, the new Government itself is the truest ‘anti-Maidan’” (Alexey Simvolokov). The struggle must continue under social slogans. Popular indignation is already on the rise due to the dramatic deterioration of the social situation. We see spontaneous pickets flaring up at bus stops against fare rises. There will be more of such social protests and they will grow into a mass social movement. We must be ready for it. And our programme should not be about changing one President for another but rather changing the whole system of social and economic relations in Ukraine. Internationalism should underpin all our actions. In any war the working class is used as cannon fodder, while oligarchs get richer on people’s blood and tears. We must agitate against war, formulating this as the most urgent task for the working class of Ukraine and Russia. This entry was posted in Marxist-Humanism and tagged Alexey Arunyan, Alexey Simvolokov, Anastasia Baburova, Bogdan Biletskyi, coal miners, Crimea, feminism, Hospital Watch, Irina Kogut, Kiev, Kirill Buketov, labor, Maidan, Nina Khodorivska, Nina Potarskaya, Stanislav Markelov, students, Ukraine, Viktor Yanukovych, Vladimir Chemeris, women's liberation, workers, youth, Yurii Samoilov, Zakhar Popovich. Bookmark the permalink.